The Official Blues Brothers Revue recreates the live concert experience, integrating the humor and songs from the original film and subsequent albums. Produced by Judy Belushi Pisano and Dan Aykroyd, the Revue pays homage to Chicago's rich history of blues, soul music and gospel in the true spirit of the original Blues Brothers. Under the musical direction of Paul Shaffer, Jake, Elwood and the high-energy eight-piece Intercontinental Rhythm & Blues Revue Band lay down a big sound, performed with the passion and precision of the original Blues Brothers. 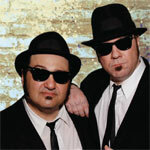 Fun for all ages, The Official Blues Brothers Revue strikes the right balance of humor, music and mayhem featuring Wayne Catania and Kieron Lafferty as Jake and Elwood. The characters of Jake and Elwood Blues, created by John Belushi and Dan Aykroyd in 1978, were initially imagined as frontmen for a fictitious American blues and soul band. Since their film debut in 1980, the irreverent characters have resonated with people around the world and the Blues Brothers have catapulted into a cultural phenomenon and musical, comedic, and cinematic legend.